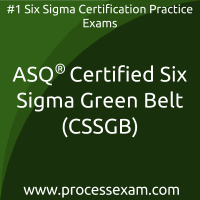 My experience taking ASQ Six Sigma Green Belt (CSSGB) Certification Exam was phenomenal! 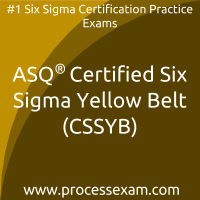 The site processexam.com is great and the materials were exactly what I needed to be thoroughly prepared for my exam. I went into the exam feeling confident and was ecstatic once I received my score back. I recommend Processexam site to all my friends and colleagues. I cleared ASQ certified Six Sigma black belt certification at first attempt itself. 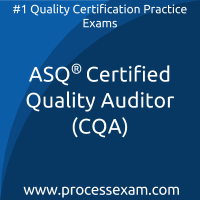 I am thankful for mock tests at processexam.com. They are very helpful. 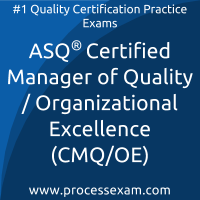 I prepared for ASQ Certified Manager of Quality/Organizational Excellence (CMQ/OE) Certification with the help of processexam.com. The site has question tests designed by experienced professionals. I was pleasantly surprised when i found that the mock tests were quite similar to the actual tests in terms of syllabus, scoring system, structure as well as the time limit. 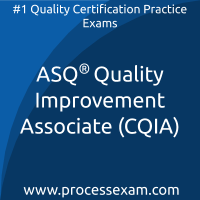 The online practice exam has a combination of practical and case study based questions that are commonly asked in the actual exam. 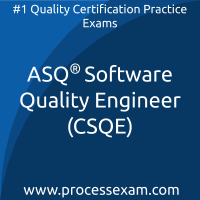 A very helpful site for the individuals appearing in the Process Exam exam. I am from Delhi in India and came across the site, process exam when one of my seniors in the office suggested me. He passed the exam with the help of the site and asked me to do the same. 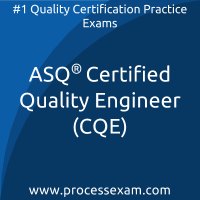 I am grateful that he did as I received better scores in the ASQ Certified Quality Engineer (CQE) Certification exam with the help of giving regular mock tests on the site.